Aleppo, Syria - Abandoned and stray cats in Aleppo, Syria, have found a friend in Mohammad Alaa Jaleel. The ‘cat man,’ as the BBC is calling him, cares for more than a hundred felines without homes in the city destroyed by civil war. In a video shot by the BBC, the animal lover says his cat sanctuary will “protect” any cat that needs it. 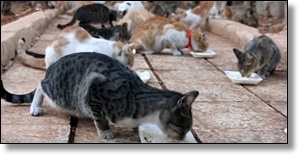 The sanctuary began with about 30 cats, but a year later that number expanded to more than a hundred. “Some people just left them with me knowing that I love cats,” he said. Other stories of pets left behind are much more heartbreaking. With so many of his human friends leaving the war torn city, Alaa Jaleel told the BBC the kitties are his newfound friends.